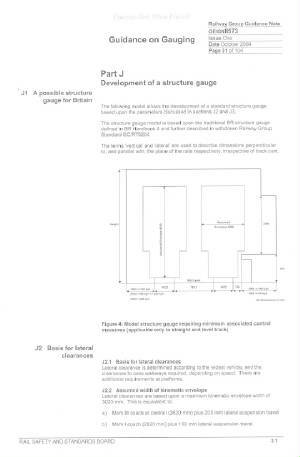 This page outlines the main design constraints for building a Railway capable of handling mainline trains without unnecessary speed restrictions or loss of preformance. 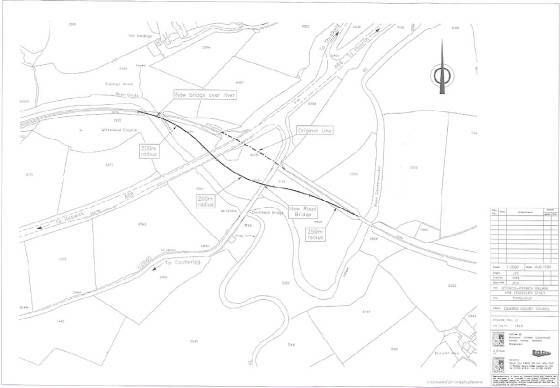 The subject of blockages, alternative uses of the trackbed, and the effects of possible new construction which might encroach on the alignment of the Railway, often arises. Frequently this is dismissed by others as something which the Railway can somehow "deal with later". In fact this is not a simple subject. Keeping the Railway's original alignment free from obstacles is vital for reconstruction at an economic cost, and to be able to provide a fast attractive service. There are limitations on the design and construction of a Railway which mean that any interference with the existing alignment can result in long (and expensive) deviations to bypass them. A main line railway can not simply "dodge round" an obstacle like a road or even a slow speed tramway might. To operate main line trains at speeds which make the service attractive, wide curves and gentle gradients are required. Tight curves and steep gradients impose speed limits, restrict the length of trains, and can make operation in poor weather conditions impossible. The examples below are based on current best practice in the UK Railway Industry, and Standards which are being developed to guide design for the future. They are intended as a simple illustration, not a full description of the rules and their implementation. Ignoring these factors through lack of knowledge simply piles up extra costs for the reconsttruction of the Railway. It was originally built on the best available alignment. Any deviation is therefore automatically less desirable, and inevitably more costly than re-using whjat already exists. For main line trains running at normal speeds, curves must have a radius of AT LEAST 250 metres. It is possible to reduce this radius, but this imposes speed restrictions. The sketch below shows how even a short obstruction of the line (a road embankment across the alignment) would need a long deviation with several curves. In this particular location (at Threlkeld) the alignment is constrained by the location of bridges at either end. The cost of such a deviation, or moving bridges, has to be balanced against the cost of removing the obstacle. In this case it is technically feasible to bore through the embankment - again at a significant cost. It would have been better, and cheaper, if the trackbed had not been blocked in the first place ! To allow passenger and freight trains to run at optimum speeds - to maximise the capacity of the line - gradients should be no steeper than 1 in 100. If gradients are steeper, problems can arise in wet weather, or snowfall. Trains can be delayed, or even slip to a stand. There are short sections of the Keswick to Penrith line, near the summit, which are steeper than this. Historical evidence exists that these caused difficulties. Nothing should be done to force the new Railway to "build-in" more such difficulties. Road vehicles can cope with much steeper gradients. This is often not realised by non-Railway planners when dealing with issues of where a Railway could be "fitted in". Building a Railway is completely different from building a road ! It is not possible to build a "hump backed bridge", or a steeply inclined "dive under" for the Railway if a road has been inconsiderately built across a Railway trackbed. Any chnge of level can result in new earthworks, and even more bridges, to be built for a long distance either side of the new feature. This new construction could stretch for a kilometre or more in either direction for one new bridge if the existing gradients are un-favourable. The diagram below is an ealy version of a proposed "universal" clearance standard for Railways in the UK. All new and re-built Railways will have to conform to such Standards. This must be taken into account if any new building is planned close to the trackbed. To prevent future conflicts when rebuilding the Railway, NOTHING should be built less than 3 metres from the original centreline of the nearest track. If there is an original Railway fenceline, nothing should be built inside that - the empty space is there for a reason, most often for visibility on curved track. Planning Policies and Guidance exist at ALL levels of Government in the UK to protect former Railway trackbeds for possible re-opening. The information above is crucial in understanding what is involved in providing proper protection. Policies relevant to the Keswick to Penrith route are listed on our "Planning Policies" page. Other parts of the UK have different policies - in some areas stricter, more detailed and more comprehensive.